Lago Escondido, the (not so) hidden lake, lies pristine below Paso Garibaldi along the road 3. It’s been one beautiful Ushuaian’ summer day and the evening promises to be spectacular. When we get to the far end of the lake, the sun is just peeking under the layer of clouds that formed in the late afternoon. 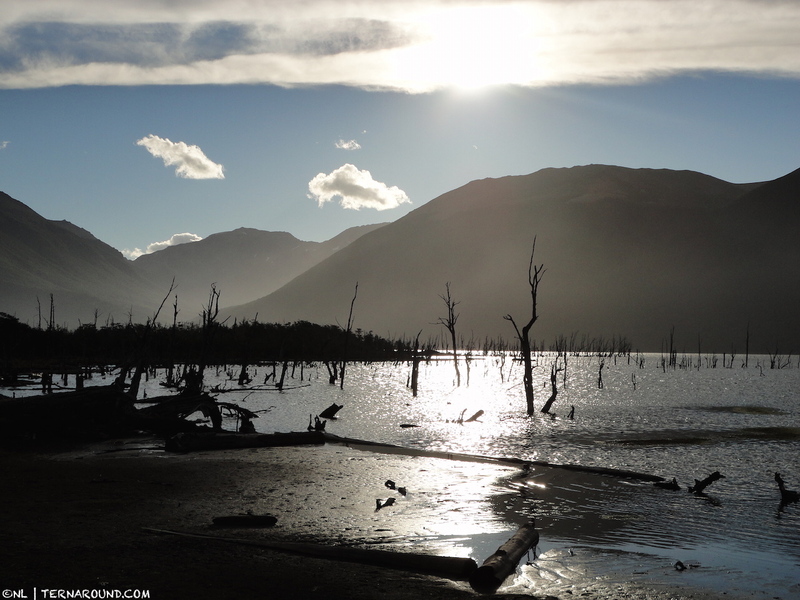 The backlight makes for a perfect scene of mountains and dead trees. The adventure yet has to start. 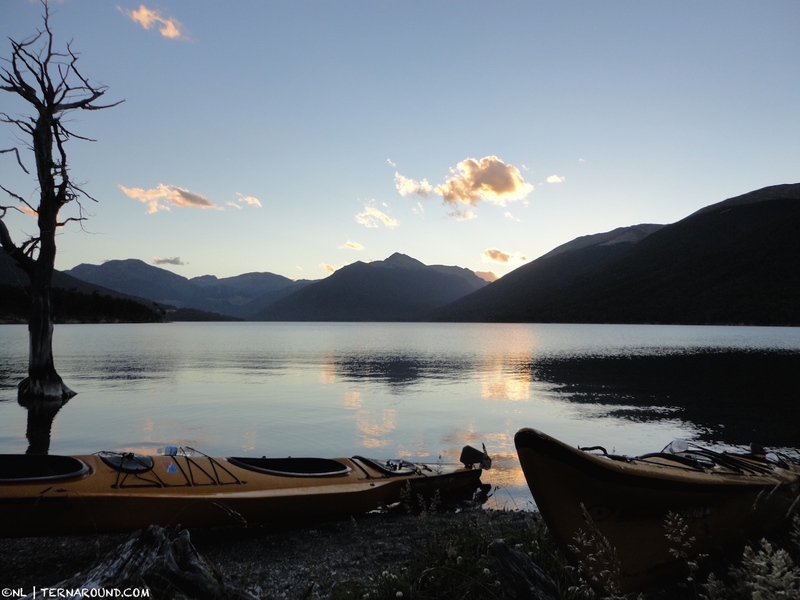 Walter and Ariane of Rayen Aventura, our guides for the evening, prepare our three duo kayaks. They make sure we’re dressed well and tight fitted. The goal is to stay dry, safe and have fun. One by one we get into the kayaks and take off. The late afternoon sun is still warm for these latitudes, and everything around us has this beautiful warm glow. We’re lucky. The evening promises to be quiet, with no wind and good temperatures. While kayaking, our guides give us some advice to improve our skills and save energy. We explore the area of dead, but still standing trees. A beaver lodge betrays the cause of the damage. Though dramatic for nature, the scenery is pretty picturesque. 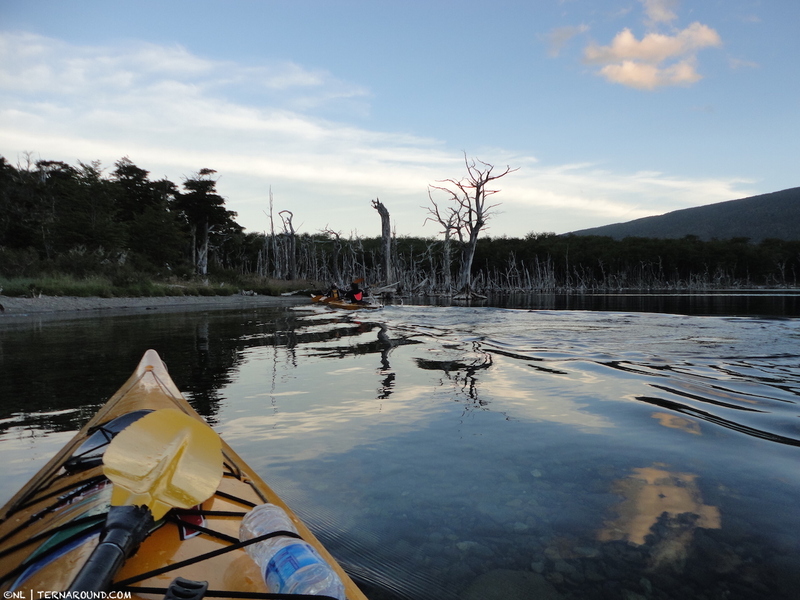 Silently we cross the lake, enjoying only the sounds of nature and kayaks sliding gracefully through the water. On the other end of the lake trees line the coast. They go up to a tree line of about 8oo meters. It’s a wild forest, with lots of fallen trees. The soil is thin, causing the roots to only grow superficially. Many don’t withstand the winter snow and strong winds typical for Patagonia. However, they remain being a natural resource for other species. The sky is all clear now and the sun is hiding behind the Andes mountains that separate us from Ushuaia. After about an hour and a half on the water we start heading for a beach in a cove. A beaver swims in between dead trees. Vegetation grows wildly around the pebble beach. If it wasn’t for the few car lights coming down the side of the lake, we well could have been on a deserted island. Preparations for a typical Argentine asado. While we put the kayaks on safe ground, Walter is making a good campfire. The hanging mosses in the trees are excellent inflammables. Bottles of beer and wine go around and accompany our entree of salami, cheese and bread. We talk and laugh, and share a mutual feeling of gratitude for this place, this adventure, this night. I go back to the beach to take some pictures. The air is still warm, the tranquility of the surrounding nature frees my mind. 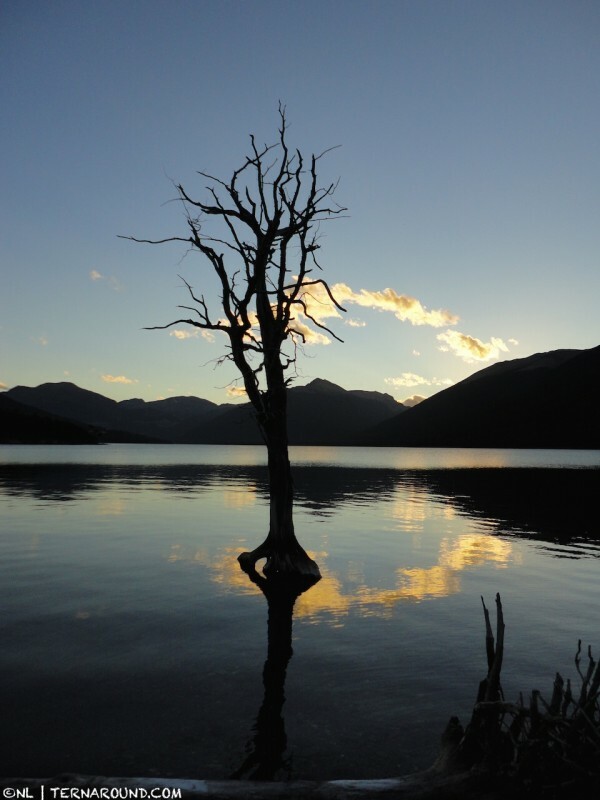 For a moment it’s just me and a freestanding lonely tree in the water. The remaining light gives a warm yellow colour to the few clouds above the mountains. The lake mirrors them. I just stand there, watch it and feel incredibly happy. Back at the campfire huge pieces of meat are grilled with onions and potatoes. More wine goes round, we sit down on tree trunks, chat, feast on the excellent steaks and watch the flames. It is an exceptionally beautiful evening shared with like-minded people. The typical Argentine asado is yet not the end of it. Slowly it’s getting dark; At the end of the world it takes quite some time between sunset and darkness. A mild breeze tells us it’s time to get going. We clear the area and extinguish the fire with buckets full of lake water. Meanwhile, as if it wasn’t all perfect yet, behind us a full moon rises. We prepare the kayaks and head back for the lake. There we lie still for a while, watching the moonlight on the rippling water. I’d wish I could have stayed there longer and absorb the energy. Some nights are nothing short of magical. Tonight the universe just seemed to surpass itself. 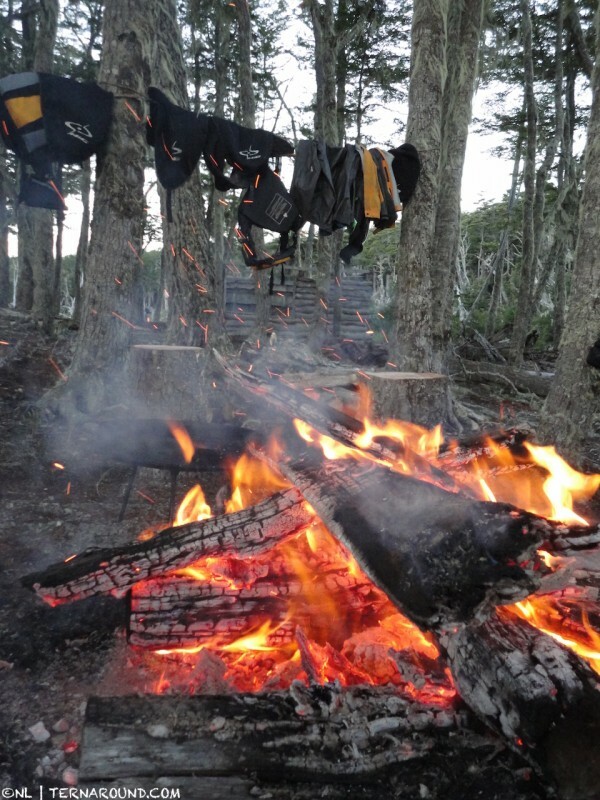 This entry was posted in Outdoor adventure, Tierra del Fuego and tagged Argentina, asado, campfire, kayaking, Patagonia. Bookmark the permalink. Prachtig verhaal met schitterende foto’s. Asado in beverlandschap, het klinkt als een perfect avontuur voor een zomeravond in Ushuaia! Hey Adriaan, dank je wel! Het klinkt niet alleen zo, het was het ook echt 😉 Een perfect avontuur!